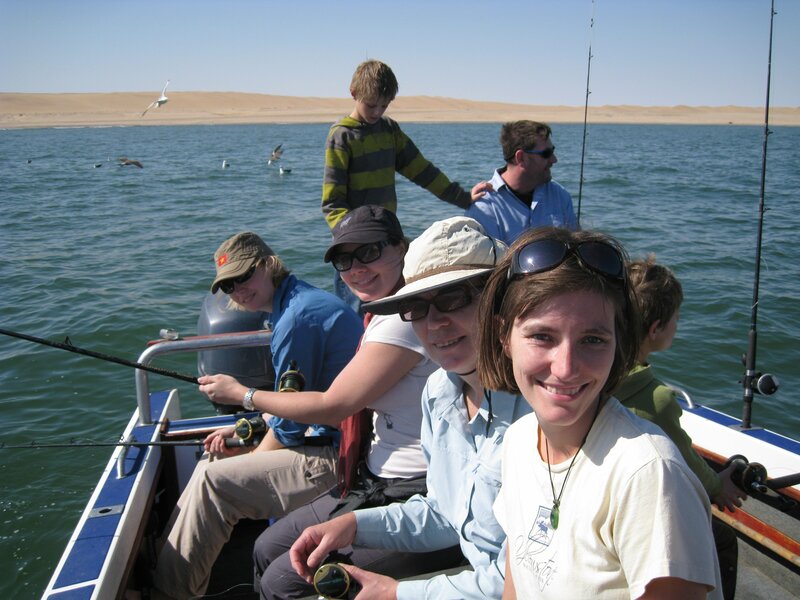 Namibia | Where is Yvette? This is the first post in months without pictures, but since it’s just a summary and I’m trying to catch up over slow Internet everyone just has to deal. Cool? If anyone’s still terribly upset I’ll add one or two pictures once the Internet connection gets better! 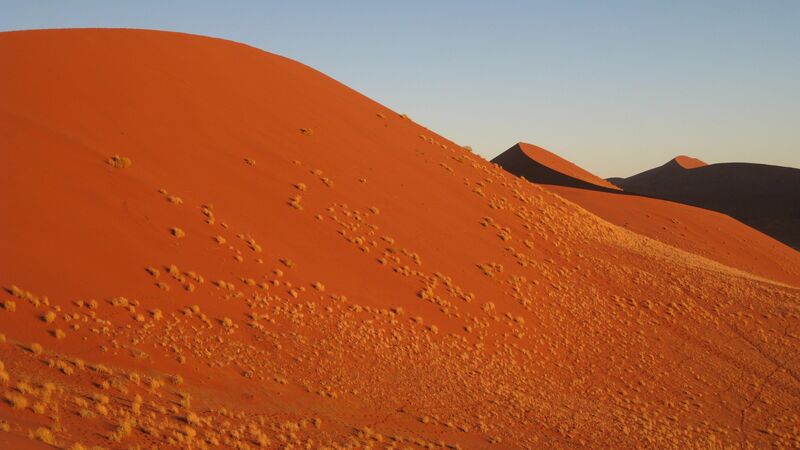 – The Namib desert, particularly Sossusvlei. I thought I had seen desert before in the American West, but trust me when I say our deserts have nothing on the magnificence of these dunes or the desolation all around! Not saying I want to pick up house and move there or anything, but it was really cool to drive for days and days and still be in the desert and all. 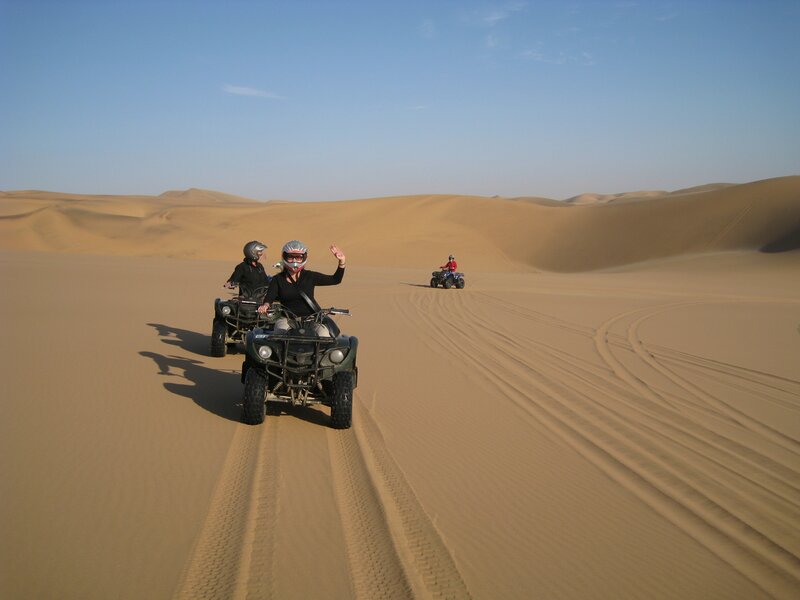 – Swakopmund was another surprise- who would have guessed there was a German town hiding in the middle of the Namib desert on the coast? With a brauhaus and bakery where you can go quad biking and fishing and skydiving and stuff? The fact that our first beds in a week were to be found here didn’t hurt either. 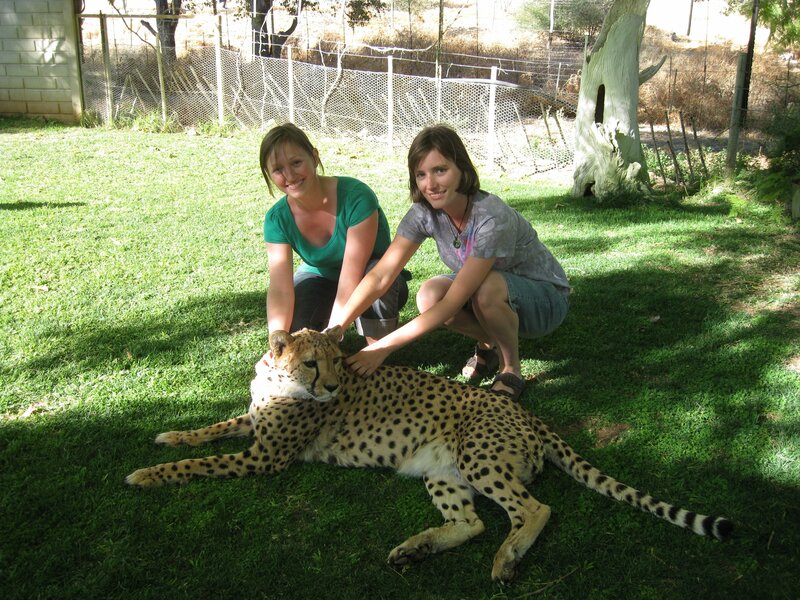 – The wild side of things (ie animals) in Namibia were pretty cool, both Cheetah Farm and Etosha National Park. I will rate Etosha as one of the better game parks I’ve been to in southern Africa, actually, because there were so many huge herds of zebra and giraffes and elephants and what have you, bigger than anywhere else we went really. – Because I found it entertaining, I kept meaning to read Dante’s Inferno ever since I visited Florence earlier this year, but finally got around to it while in Namibia (well, skimming to the interesting parts). What were the odds that a 15 year old on our truck would have it for “fun” reading and lend it to me, I ask you? – On another list of firsts, I had some currency stolen from me from our guesthouse in Swakopmund, the first time I ever had something stolen from me on this trip. It wasn’t a dehabilitatingly large amount or anything but it was someone from our overland group, as evidenced by how other people had money stolen in similar fashion. For lack of anything better to do, I’ve just chalked it up to “travel shrinkage” and kept an extra close eye on our things from then on. Etosha is the big national park in Namibia- think Serengeti or Kruger equivalent- meaning a game drive naturally ensued. For the sake of the fact that I’ve already posted lots of game drive pictures and have more to catch up on in Botswana, here’s just a quick run-down of the highlights. Finally one of the springbok actually went up to the water just in front of where the lioness was, and she went for it. It turns out springbok are significantly faster at running than a lion- that’s why they need an element of surprise obviously- but the chase was amazingly exciting and the lioness got within a meter or two of a kill. Pity she was a bit young and inexperienced! A giant herd of elephant crossing the road- I think I counted 34, anyone remember what the exact number was? The funniest thing was these guys had just left a water hole and had a young bull elephant running while trumpeting after them, obviously miffed that the group had left before he was properly ready. Something else spotted by the side of the road- a puff adder, one of the deadliest snakes in the world. What’s even more disturbing is this isn’t the first time we’ve seen a puff adder in Namibia- we ran into one in Sossusvlei- and there was even a black mamba at one of our campsites two nights earlier. My best snake story, by the way, happened at the black mamba campsite at about 3am when I went out of our tent to find a bush to go to the bathroom. Not too far from our tent my headlamp caught the light of two green-white eyes in the grass so I stopped and stomped my feet a few times in case it was a snake (they feel through vibrations so it’s the best way to make yourself known). The pair of green-white eyes then glided towards the left and front in the grass, and to make me feel even more wonderful they disappeared altogether as the probably-a-snake turned around. Needless to say I finished my business closer to the tent than was probably hygienic and was never as happy to go back inside! As a final thought, Etosha probably had the coolest campsite we’d been to in terms of nighttime entertainment. Why? Because it was next to a water hole that they strategically placed floodlights around so you could spend the evening watching various game as they came to the waterhole. So cool! The picture above is obviously a waterhole daytime shot- my camera didn’t much like the dark- but we spent about two hours there watching elephant, springbok, a hyena, and jackals loping in and out to drink. So very cool. Safari is awesome. Here is a rule about visiting the Cheetah Farm: if you are doing so with a sister who works at the National Zoo in Washington D.C. and wanted to be a “cat specialist” while growing up, do not under any circumstances give her your camera on a visit to said farm. You will get it back to discover you have more cheetah pictures than pictures of any other activity you did on your trip! As an explanation, cheetahs are currently classified as vulnerable bordering on endangered and Namibia has the largest population of cheetahs in the world. Farmers don’t like cheetahs because they attack cattle, so in order to save the animals a family of Afrikaans ranchers opened up part of their land for cheetah conservation. Called Cheetah Farm they currently have about 25 cheetahs in the park, two of which are full grown tame cheetahs the family raised because their mother died when they were young. The dog is interesting too actually- he was the family’s pet before they got the cheetahs, and when they were cubs he was bigger than they were. 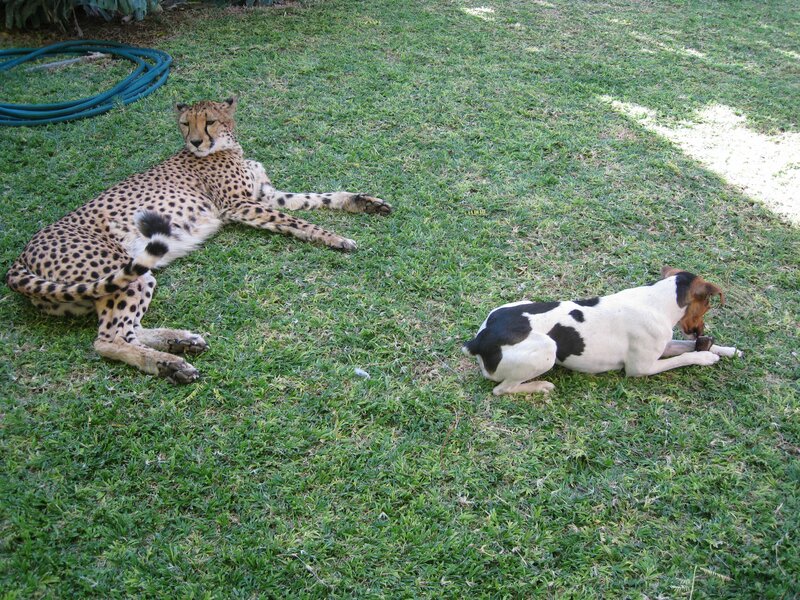 He still thinks this is the case even though it’s patently obvious it’s not, leading to the entertaining discovery that there are few things in life more entertaining than a terrier that thinks it’s a cheetah! Oh, and they have cheetah cubs at the cheetah farm too! Yay! Most of the cubs are being raised by their mothers, but this little lady is the exception because she was born partially blind and needs to be raised by humans as well. Her stomach looks a little funny because it has a bandage on it hiding a wound she kept licking. Speaking of babies, it’s a baby giraffe attack! Ahhh!!! This big fella’s mother was unfortunately killed when she walked into the property’s electric fence (it’s still foremost a cattle ranch), so this guy has stuck around ever since. He took it upon himself to investigate the backs of the pickup trucks we were being transported in, and proceeded to slobber over everyone. But he let everyone pet his neck and had a fondness for sucking thumbs, so I suppose we shall forgive him. Towards sunset, this was the view we got from the back of the truck. Doesn’t it look, well, evil? There is a cheetah gang stalking us! Ah this is why- feeding time! (Thanks to Linda for figuring out the setting on my camera that allowed me to take this amazing shot!) 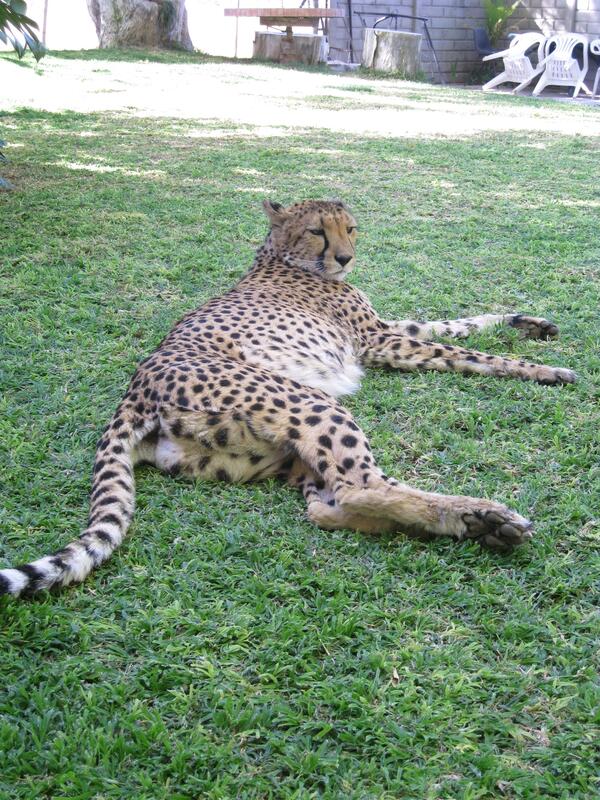 There are currently too many cheetahs in the park for the space they have, meaning nowadays the cheetahs are fed chunks of donkey meat each night. (They are still wild cheetahs and know how to hunt game, but there’s definitely not enough to go around.) And damn it is cool to see over 20 cheetahs jumping into the air for their dinner! Namibia is a neat place, but I’d never exactly look at the empty sand dunes and jump off a boat to say “wow, I want to start a colony here!” But that’s exactly what the Germans did here in the 19th century, no doubt starting to feel left out of the colonial scramble and figuring an empty desert was better than nothing. Then after the Germans lost WWI Namibia, then known as “South West Africa,” was handed over to South Africa for administration who ruled it until 1990, the last two decades of which were marred by various states of civil war. Nothing like showing up in a country to learn you’re older than it! 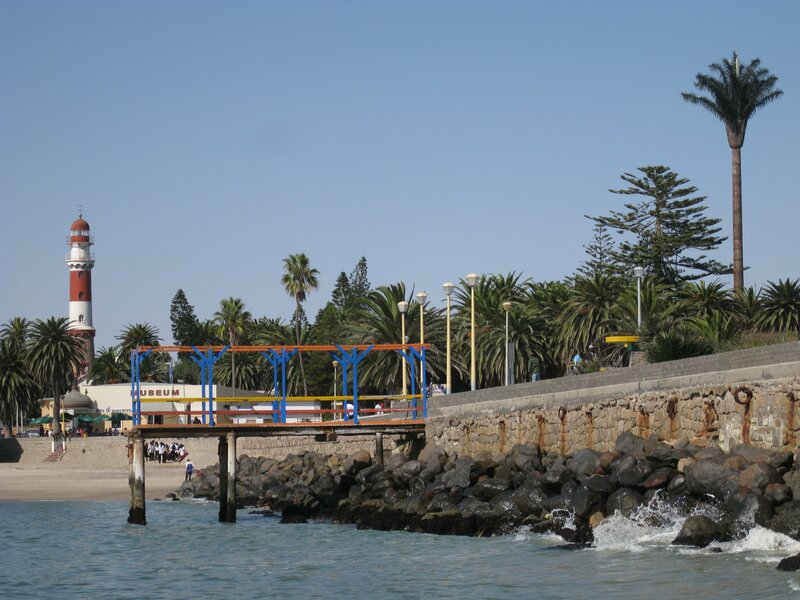 Anyway, one of the colonial legacies from the Germans is the seaside resort town of Swakopmund, which for all intents and purposes is a German town that got plopped down in the middle of Africa. All the white people speak German, you can get the most delicious black forest cake you can imagine at the bakery, and all Namibian beer is the best you will find in Africa. 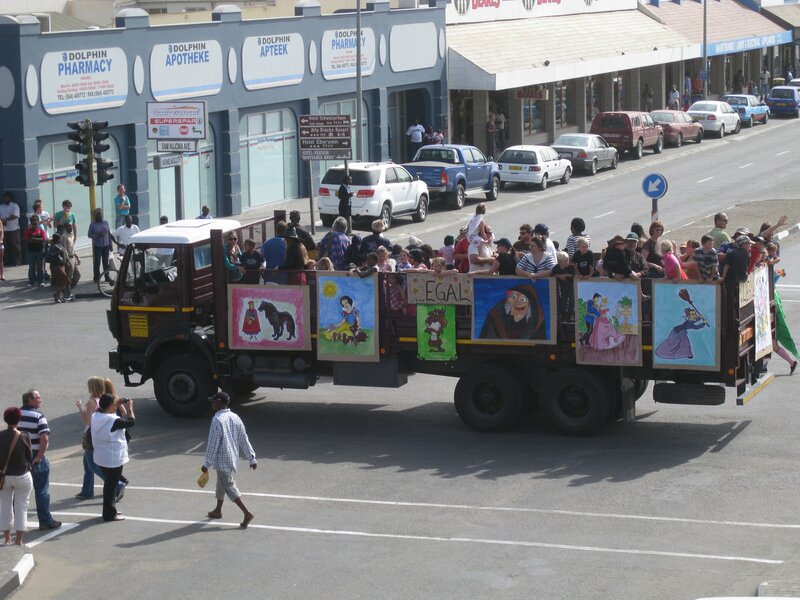 Our visit also coincided with “German heritage week” in Swak, meaning we got to see a parade that basically looked like a bunch of Germans getting pissed on the back of trucks while driving through the streets. See, totally German! Anyway, getting on with things it turns out Swakopmund is billed as “the adrenalinen capital of Namibia.” (Which I find silly actually- I haven’t seen a town of comparable size in Namibia, let alone one where you have any touristy things to do!) Linda took this to heart by doing sandboarding and skydiving here, but I’ve done skydiving before and wasn’t completely interested in sandboarding, so those are her stories to tell. 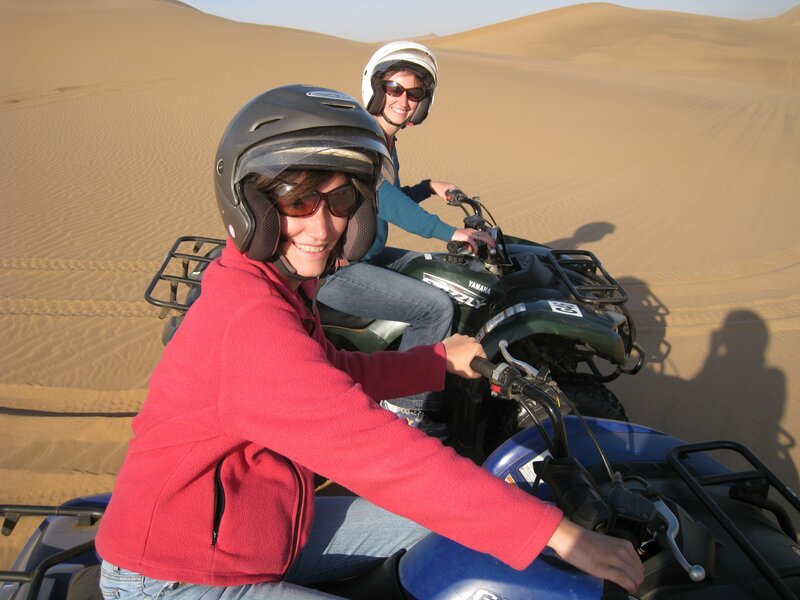 But both of us joined forces for a bit of desert quad biking! It turns out quad biking is marvelously fun and I can recommend it. My only comment on this is if you do it over sand you need to be very careful and not be too reckless- two girls tumbled while driving semi-automatics because they had no real experience with them, and one woman who wasn’t following the leader rolled with her bike after cresting a dune too quickly. (The latter was right in front of me actually, so I am adding that image of her tumbling with her bike and lying motionless at the bottom with part of it on her as one of the scariest things I’ve seen.) Luckily no one got hurt, but you definitely need to exercise caution over something as frictionless and unpacked as sand. For my second activity of the weekend, I went fishing with three other Aussies from our truck and a South African father and two sons on holiday. I’ve never really gone fishing before for some reason or another but always wanted to try it, and luckily found a great crowd to do it with. Even if by the nature of them being Aussie I started drinking beer at 9am for the first time in my life- hey, it’s what you’re supposed to do whilst fishing right? Anyway, fishing was really fun but I think I’m ruined for life. Why? 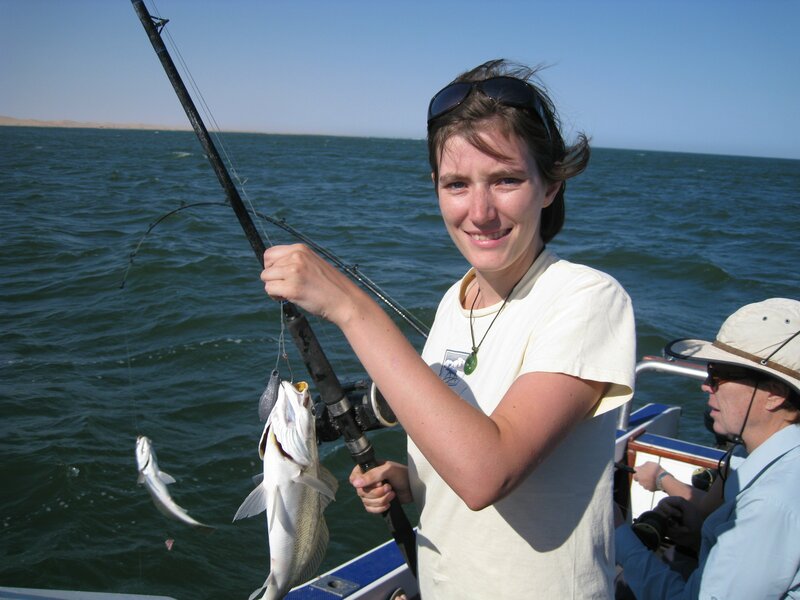 Because this fish is one of seventeen I caught during the course of a morning- three catfish and the rest a species called kol. And something tells me I shouldn’t expect to normally catch one fish every ten minutes or so, right? 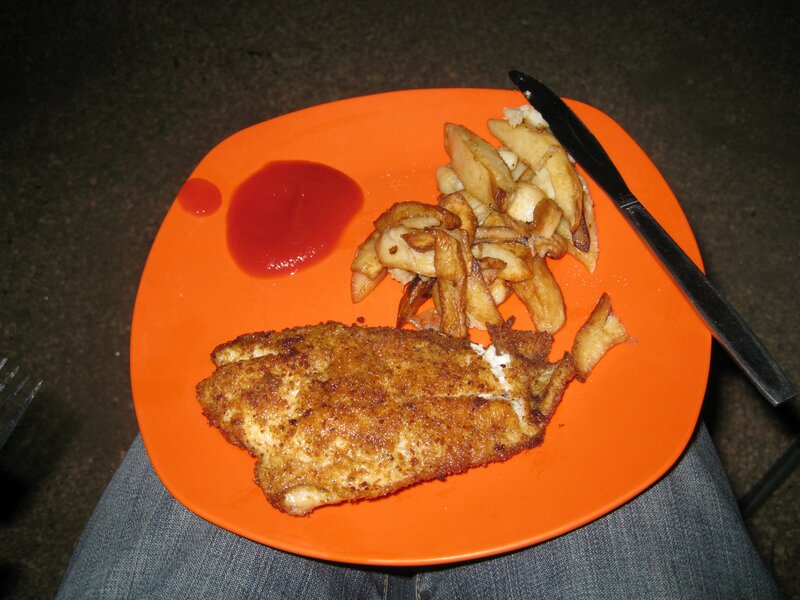 Not to make you all think that all of our fishing went to waste, here is a picture of our fish and chips dinner the night after we left Swak, as the four of us caught enough to feed the entire group. Interestingly I usually don’t like fish, but I really liked this stuff. I guess there’s a difference if you catch it yourself! So how did all this sand get here? Well it’s originally from South Africa- erosion on the coast- and is brought up in the current to Namibia where it washes up on the coast. Then slowly but surely over millions of years the sand gets blown inland, creating what you see. They’re a bit red from the iron content in the dune, which of course turns into rust. 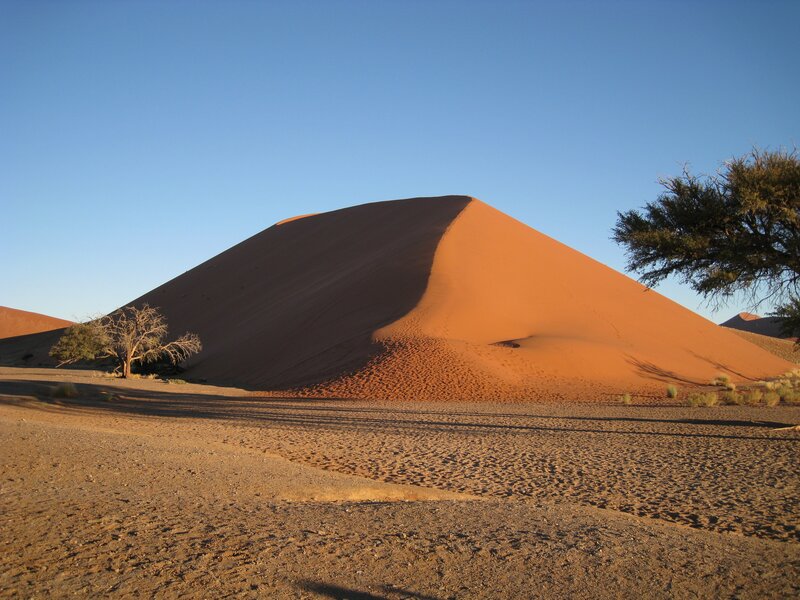 This is Dune 45, so called because it is the 45th dune from the gate into the park and coincidentally 45km from the campsite. At 170m it’s not the biggest dune or anything like that, but it’s got a good spine for tourists to climb up to watch the sunset (or sunrise for the particularly masochistic) but still conveniently close enough to the gate that you can make it out before the park is closed. It turns out it’s surprisingly hard to climb up a sand dune by the way as your feet get really tired without having a good grip, but going down is very fun after you’ve watched the gorgeous sunset. Basically you just barrel down as fast as you can manage taking care to lean a little backward if anything, and momentum gives you a great speed to keep going. 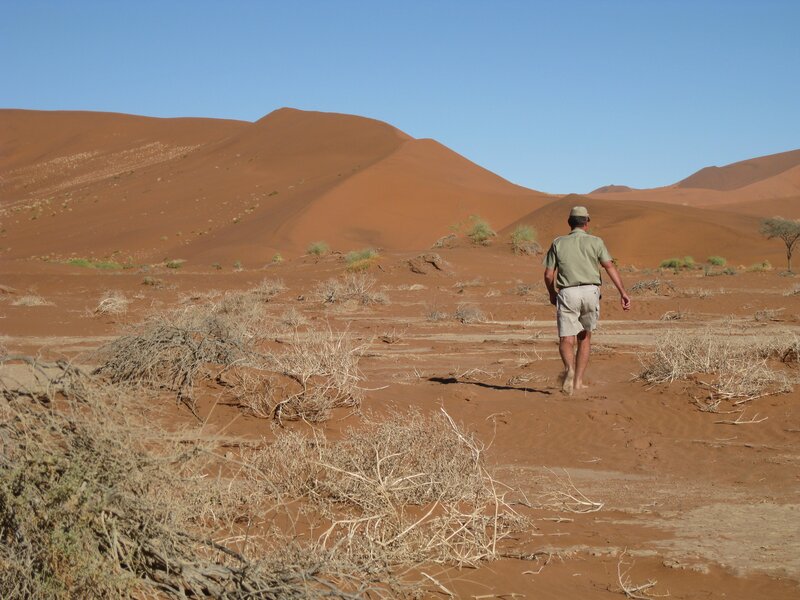 Another thing that was a true highlight of Sossusvlei was the Desert Walk, led by a slightly crazy Afrikaner pictured above. He is pictured as walking far ahead because this guy consistently power walked several meters in front of the group so that none of us thought keeping up his speed was possible. While barefoot. It’s kind of weird to say that going around to walk into the desert to learn about sand and bug tracks and whatever else was cool, but with a charismatic guide it really was. Plus somewhere between showing us how to catch a lizard and how to coax a spider out of its nest I figured this guy would be great on Survivor Man: Namibia or something similar. And this, ladies and gents, is my footprint in the sand. 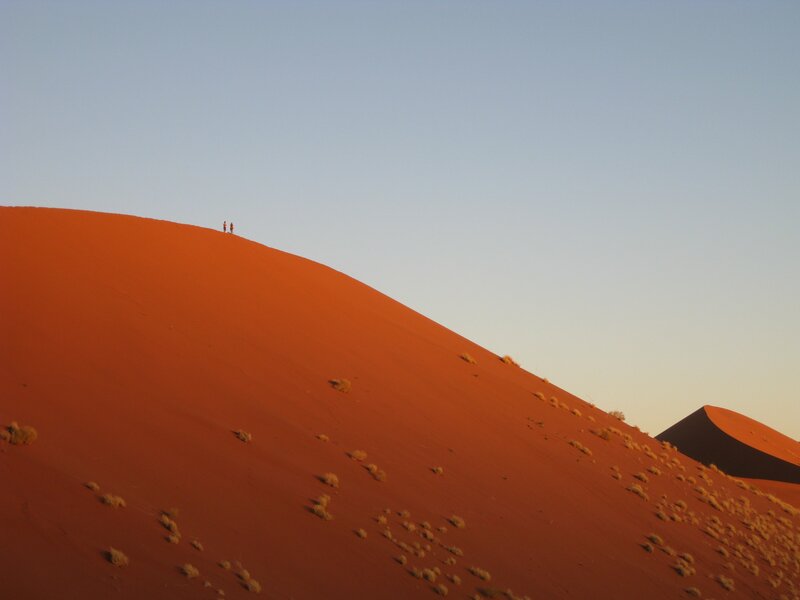 I didn’t take this picture just because it was a lot easier to walk through giant dunes whilst barefoot, but because of the indigenous bushmen tribes who lived in the area. 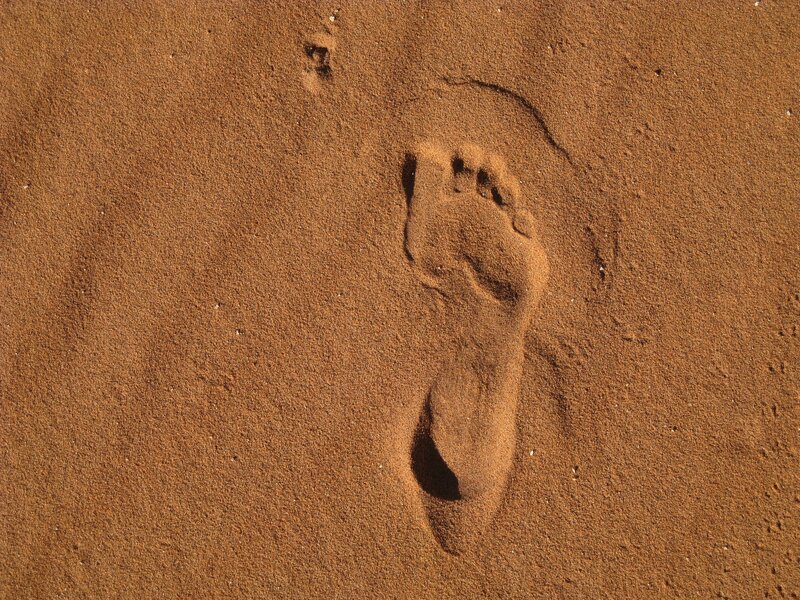 Back then if you were a bushman (who were originally yellow-skinned and capable of eating 10kg of meat at a time) the first thing you learned as a child was how to identify your mother’s footprint in the sand, followed later of course by those of everyone else in your family. Each person’s footprint is unique so later on in life if you’re wandering and happen to see those prints you will be able to meet up with long-lost relatives. So just in case you ever get lost in the Namib desert and you spot this print, come say hi to me will you? I know you hear it often, but one important thing to never forget about a desert is how even though it looks like nothing could survive out there lots of things cope and thrive, even if it means living 20 years without ever drinking liquid water. What’s the coolest thing we saw? 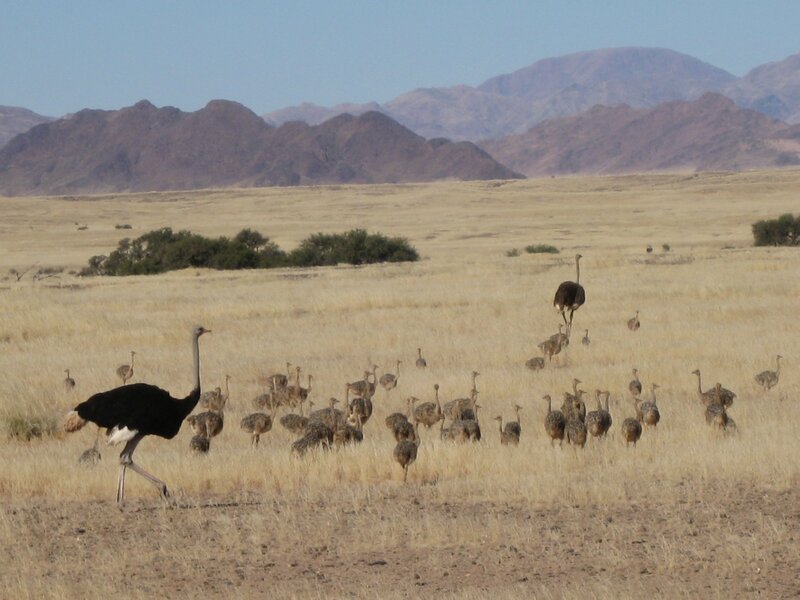 How about a pair of ostriches with about 50 little ones between them! It turns out in the wild ostriches wait until the rainy season every few years to have their young, and to maximize their offspring whenever two sets of proud ostrich parents meet they fight over who gets to keep the young. Whoever wins gets the thankless task of raising the loser’s kids on the grounds that they are better prepared to protect them from predators, while the losers have the punishment of having to go off and make more ostrich chicks. I know, ostriches are totally doing it wrong. But more on them later, assuming I ever catch up enough to talk about my time on an ostrich farm in South Africa. 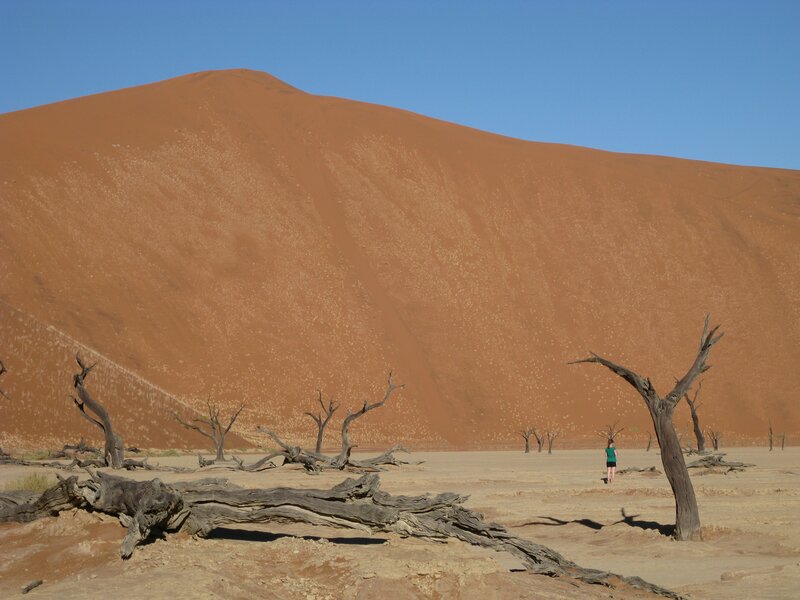 Namibia is desert. One long, neverending desert which takes days to cross on dirt roads. 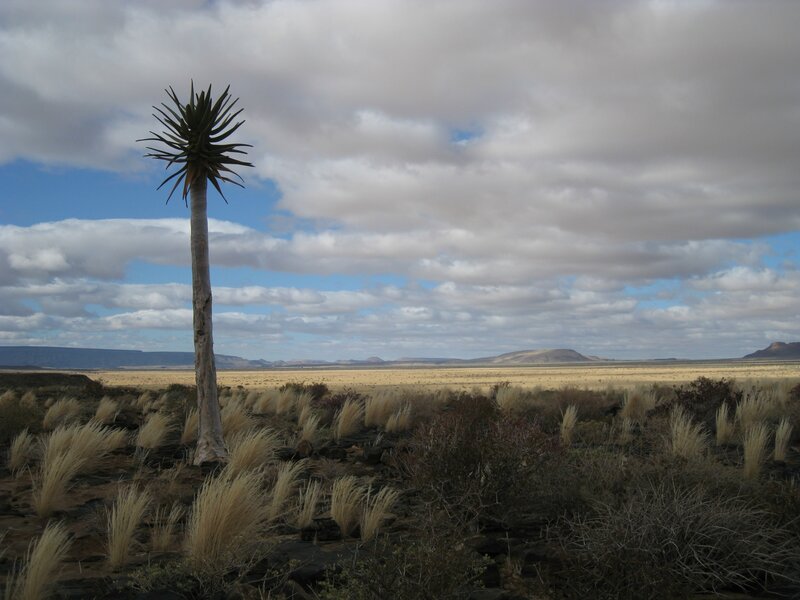 You hardly pass a town or house a day for most of it it’s that empty, as at less than two people a square kilometer, Namibia is one of the least sparsely populated countries on Earth. I’d never seen anything like it- for awhile I likened it to driving across Nevada until I realized there’s no way Nevada takes this long to get across and you run into some form of civilization every few hours at most. The best thing about this desert is how amazing things keep turning up in it that you never would have expected. 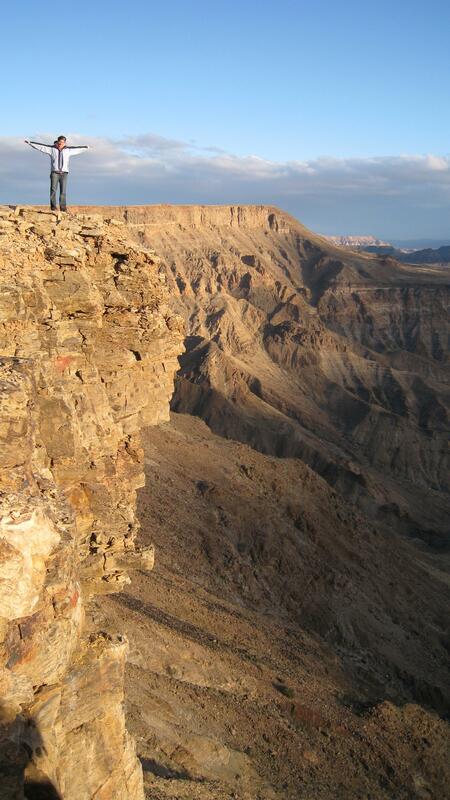 Like how about the second-largest canyon in the world? 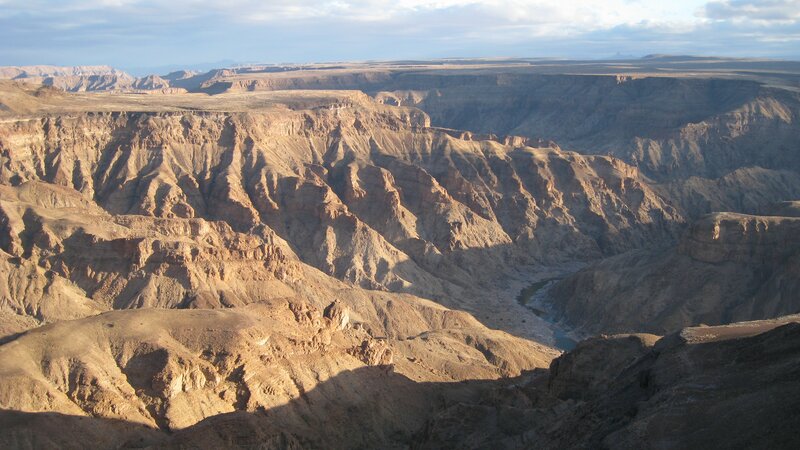 No one has ever heard of the Fish River Canyon, mainly because it’s in the middle of nowhere, Namibia. If it was a bit more accessible I’m sure we’d all go on family vacations to see it, but frankly it’s a several days drive from anything so no one bothers except crazy overlanders. A bit of the vertical scale in the canyon. Compared to the Grand Canyon that is undoubtedly the more colorful one- lots of reds there but none at all here- but other than that they’re pretty similar. Sure the Grand Canyon is longer, but not like you can tell from the ground. I keep saying there’s next to no one in Namibia, and while that’s true there are obviously a few native nomadic tribes in the area. 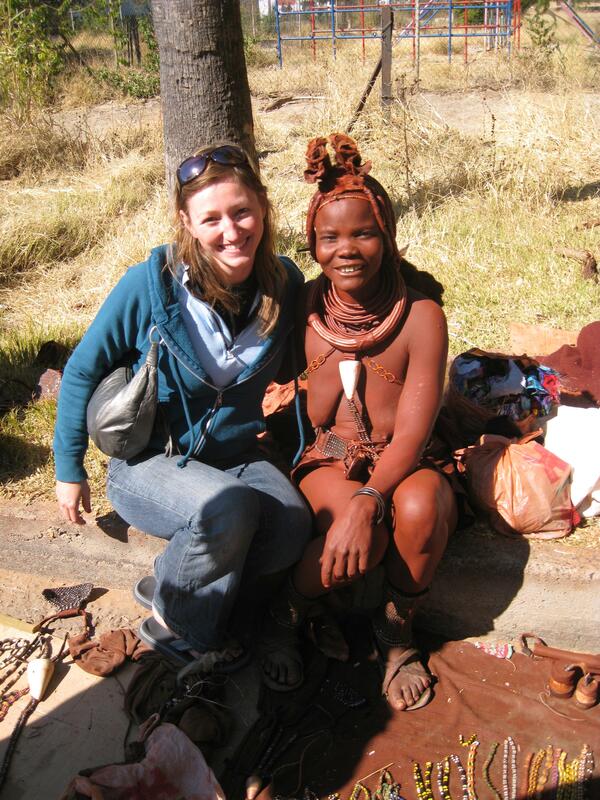 The most famous are the bushmen, hunter-gatherers whose numbers were tragically decimated by white settlers, but the Himba tribe has definitely been on a few National Geographic covers. We ran into a few Himba ladies selling jewelry in a small town called Opuwo and bought a few bracelets from them- funny thing is I never wear bracelets but have taken to wearing my patterned one made of cow horn regularly. And in case you were wondering yes, none of the Himbas wear any more clothing than this woman and the reddish color is from a spread of butter and ochre to thwart sunburn. What a beautiful, strange country.